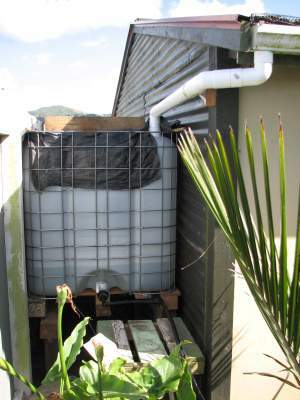 A project to install cheap (used) 1000 litre tanks to collect rain water for the garden. Pacific Wallcoverings in Porurua sell used 1000 litre tanks that held cellulose based (non-toxic) wall paper paste for $85 each. The tanks measure 1m wide x 1m tall x 1.1m long. The space between our garage and the back fence 1.05m wide - just enough to fit 4 tanks, for a total of 4000 litres. I'll use this for watering the garden in summer. In winter they'll help reduce peak flows off the garage roof. And eventually I'd like to connect the tanks up to the toilet and washing machine. The tanks I bought were made in June 2007 by Sotralentz Packaging in UK or Spain. According to their IBX SLX 1400 data sheet they are made of high density polyethylene (HDPE) and have a life span of at least 5 years. They should not be left in direct sunlight (UV) for long periods. The Aquavate 520 upon contact with water will form a viscous gel. 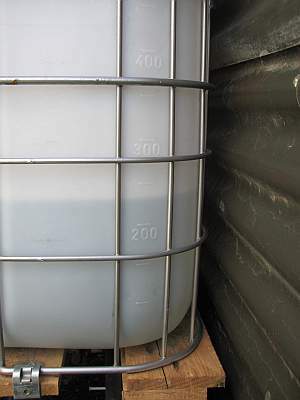 This gel is completely free from hazardous substances - whereas it might not look too pretty it is still a similar product to those used in garden centres to keep plants wet (gels don't really dry out) and are often mixed in with fertilisers and used in grow bags. Half a litre of paste should be fine (ten litres or so might block up your drain). I'd attack it with a hose to loosen it, pour in 20 litres of water, then "mix it up" with the hose again, and then discard down the drain. I prefer not to just toss it down the drain - I've got a bucket of the goop and am looking for a better use for it. Perhaps I should use it in the garden when I plant new trees or shrubs? If you have a good/better idea please email me. Saw - for cutting the piles. Note: Actually it was cheaper than that because I already had some of the drain pipe and fittings, and some 100x100 H4 fence posts - so all up it probably cost me more like $500. 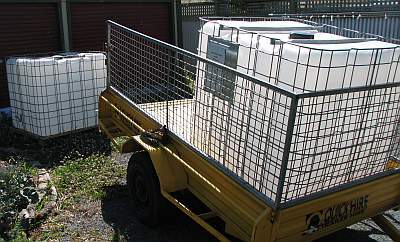 Hired a standard trailer from BP Waiwhetu. The 2 tanks fit on the one trailer perfectly. Note: the 1000 litre tanks are not pretty. So if you plan to use them - try to locate them somewhere hidden from view. In my case - behind the garage. Cleaned out the tanks using a mains pressure garden hose. It took about an hour to do both tanks. I used the hose to loosen the remaining goop, then drained each tank into an old sheet. This collected the goop and let water drain through, onto our gravel driveway. So now I have a bucket full of the goop. Dug six 0.5m deep holes, roughly 1m apart, behind the garage for a wooden base for the tanks. I'm using grade 4 treated 100mmx100mm fence posts. Concreted the posts in place so that they are 550mm above ground level. Once I've added the 100mmx100mm bearer on top it'll be 650mm high. This will put the top of the tanks at about 1800mm - which is just below the top of the fence. Nailed bearers in place with hi-tensile steel strapping. Shifted tanks onto bearers with help from Patrick and Stu. The end result is just far enough below the fence top that they are nicely hidden from view - both from the stop-bank behind the fence and from the house. Connected tanks together using Neta 19mm tubing and fixtures. The tanks come with a black screw cap over the end of the valve. I drilled the middle of the cap out and fitted a NETA 19mm "tub outlet" fitting, sealed with silicon sealer. From there it's all standard NETA 19mm irrigration pipes. I chose 19mm rather than 11mm to allow for a bit more flow. Added a pipe to a garden tap next to the garage door. Covered both tanks with black polythene to protect them from UV. Connected downpipe into first tank. A southerly storm blew through in the afternoon and delivered a heavy downpour which resulted in 230 litres of rainwater collected. I disconnected the pipes from the tank to flush out a few litres - just to make sure it was clear. Then I connected it back up and opened the valves between the two tanks. So I'm now collecting into both tanks. I also unscrewed the lid on the second tank a bit to allow air to seep in and out, as the water level rises and falls. From now on I'll multiply the level indicated by two to get the actual amount collected. Got back from holiday to find 860 litres in the tanks. Bought another two 1000 litre tanks to install behind the garage. Mean Rainfall (mm): Jan 86, Feb 85, Mar 90, Apr 87, May 109, Jun 158, Jul 131, Aug 132, Sep 115, Oct 139, Nov 106, Dec 93. With four 1000 litre tanks I'll be collecting up to 4000 litres (4m3) of the potential 55,289 litres that the garage roof will receive. "On average in New Zealand we use 50m3 per person per year." This suggests a budget of 100 litres per day for the garden. Of course, we don't bother watering the garden in winter - only in summer. That suggests that if I started summer with a full 4000 litres I'd have 40 days worth of garden watering. The low rainfall months in Lower Hutt are late January through to the end of April - roughly 100 days. The driest month is February with 85mm of rain - which equates to 3,530 litres of water on the roof. One of the speakers in the workshop mentions that you should expect to loose 5 to 10% from that ideal. So - in our driest month I can expect/hope to collect about 3,000 litres. Cleaned out the third tank. I drained the water and goop into an old sheet in order to capture the goop - which I then slopped into the bucket with the first two tanks residue. Then shifted it into place behind the garage and connected up to the existing tanks. Cleaned out and positioned the fourth tank. Connected up the drain pipe. I'll wait for a bit more rain to flush this tank out some more befroe I connect it up to the existing three tanks. The rain over the last week mean I'm back up to 1000 litres of water in the tanks. Added a (19mm polythene pipe) drainage line at the 75% mark with a valve. This allows me to drain the top 25% of the tanks (top 1000 litres) directly to the garden in the event of heavy rainfall when the tanks are already quite full. So in winter I'll leave this open to drain whenever needed. But in spring and summer I'll keep it closed so that I can hang on to the maximum amount of water. Paul, I quickly read your message about water tanks and collecting a full tank before the summer. Would this get stagnant if a tank filled up a while before summer use started? Might some need draining off? We're currently using this to water the garden. As such we use roughly 100 litres every 2-3 days. I'm hoping that will be enough to avoid stagnant problems. When I was installing the drain pipe on the 9 March I noticed some "dirt" in the bottom of the tank. We've got heavy machinery working on the river bank behind our house which results in a lot of dust blowing around - so I'm guessing it's wind blown soil. Given that I'm using this water on the garden - that doesn't seem like a significant problem. I'm planning to flush the tanks completely later in the year when it's raining a lot more. Hi Paul, Just in case you get anybody in the Auckland region asking about the source of plastic water tanks. I got a couple from "Flint Industries" in Penrose, Auckland. These had contained acrylic base for paints, they rinse quite well but the usual acrylic smell lives on, but will leave them open to air prior to installation. As the water is only for they garden, I'm sure plants won't mind!!! Thanks again Brian. Bury irrigation piping under the vege garden(s). maybe I need a header tank on the side of the house (above the toilet)? why not just use water from the house roof for the toilet? 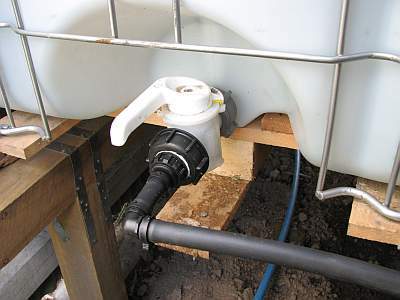 I could build a raised header tank that fills from the house downpipe, and gravity feeds into the toilet cistern - thereby avoiding the need for any sort of pump (which would require electrics etc etc). There's enough height between the roof gutter and toilet cistern to fit a 200-300 litre hand made tank. that wouldn't satisfy the clothes washer demand though I think. I'd better measure our real toilet and clothes washer water demands. I don't want to have large tanks near the house because there's not that much room need the bathroom corner of the house. I've recently read a detailed book on rainwater harvesting [whose name I can't quite remember]. The best idea I took from the rainwater book was to use a pantyhose as a filter on the inlet. Cheap and easy to replace - just let it hang down into the tank and replace it every 6 months. This should collect most of the "large" debris that might get washed into the tank. A first-flush diverter is better, but costs a lot more. Paint the tanks a dark colour (I should have done this before installing them) to reduce algee growing in the bottom of the two outer tanks (which get all the gunk that is washed off the roof. The middle two tanks seem to be fine. I also recommend Create an Oasis with Grey Water.